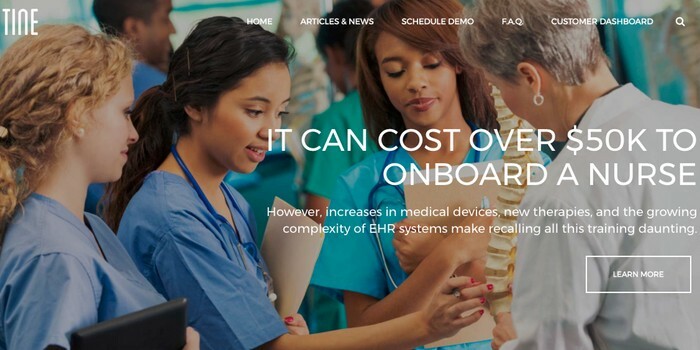 Tine Health uses just-in-time education to reduce preventable medical errors, saving both lives and money. The annual cost of measurable, preventable medical errors is over $17.1B. And most large hospitals in the U.S spend about $20K per nurse per year on training. Even with so much spent on education, nurses still cannot be expected to remember everything. The number of medical devices, new therapies, and complicated EHR systems is growing exponentially. In many cases, nurses use devices very infrequently. On top of these two issues, nurses must also deal with their humanity, i.e. they cannot be expected to remember everything. Tine Health helps hospitals to reduce preventable medical errors by providing short refresher videos to nurses at the point of care. The founders of Tine, Vik Thairani and Nivas Chervirala, met in 2010 at the Haas School of Business in Berkeley. Veterans of the mobile industry, Vik & Nivas wanted to create a way to make the world around them interactive. In 2013, they came together with Nedda Toofer to build a startup around their combined expertise in AR & IoT. They initially created a product for consumers to take user-generated content and easily augment the things around them. Customers used the technology, but the startup did not see the exponential growth sought by venture capital investors. Tine was missing a critical use-case for technology. In a serendipitous moment, a Chief Nursing Officer at large hospital reached out to the team to see how she could use the product at her hospital. The rest is history. Tine Health’s solution consists of a content library, smart tags, mobile apps, an enterprise dashboard and a video delivery/management system. With Tine Health, nurses can point their smartphone at a medical device and watch a 30 to 90-second refresher video, which reinforces the classroom training they had already received. On the backend, an admin dashboard provides predictive analytics to hospitals, helps to track the nurse’s competency, and reduces hospital liability with audit trails. A confluence of circumstances made this technology possible, including recent changes in healthcare billing, the proliferation of smartphones and data speeds that support video, and a focus on hospitals to reduce medical errors. Deploying Tine Health even five years ago would have been very challenging. Education in healthcare has been transforming dramatically with the expansion of EHR systems, new therapies and an influx of medical devices. Most traditional teaching methods focus on providing regular training or moving the training from the classroom to online, which require the nurse or therapist to rely on their memory when using a medical device at a later time. Tine Health takes the opposite approach, enabling nurses to view contextually relevant content immediately before a procedure. Two large healthcare institutions currently use Tine Health, and the company is now in talks with multiple hospitals, with a goal of onboarding ten new hospitals by the end of 2017. Learn more about Tine Health and the Dreamit program. Sign up to our newsletter to deliver health tech content every week. Hear founders, investors, innovation executives and other experts give advice on building the traction you need to raise your Series A.